Apologies for being away from comics for so long, folks. If you’ve been following me on Tumblr, I’ve been regularly posting older content from this site for a new audience and I’ve been generally pleased at how well-received they’ve been. I took that step because frankly, teaching 7 classes with no break had finally gotten the better of me and I was starting to feel a bit burned out. I don’t believe my work was suffering but my hobbies definitely suffered… ergo, the lack of posts for most of the last month. 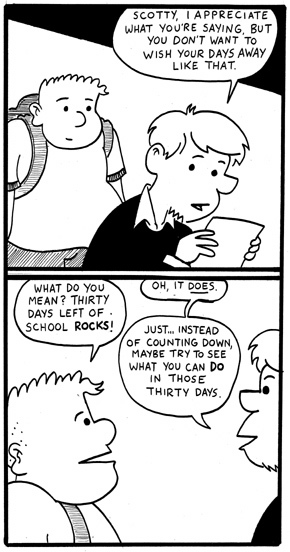 This comic should easily lead into next year’s run of strips though, which should pick up in September. In the interim, I will continue my tradition of posting summer journal comics featuring my wife and children starting this Monday. I’m sort of paraphrasing The Thief of Always by Clive Barker here and it’s true. Sometimes constantly waiting for some soon-to-come thing will blind you to what could happen in the now. This is a follow-up to yesterday’s comic. Of course, I know teachers who twist and contort the calendar to make it sound like we have less days. One colleague of mine recently told me that we technically have even less days than the students are saying because we teachers have a few professional development days coming up… and those days aren’t really teaching days, so they shouldn’t count toward the overall total. 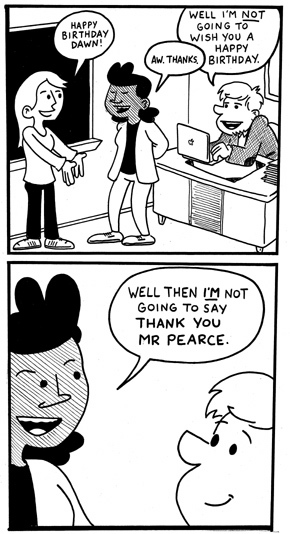 Teacher Comics: I’m not your butler. I’m often amazed at students who think I should be at their beck and call whenever they have some small need. 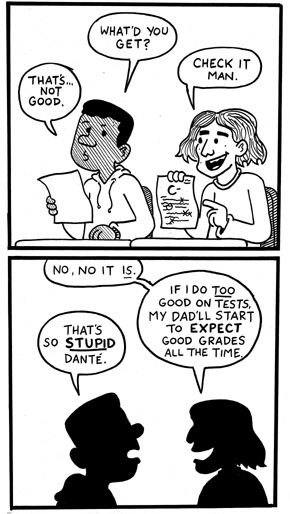 I’m not going to put too much stock into these test scores, is I guess what I’m saying here. 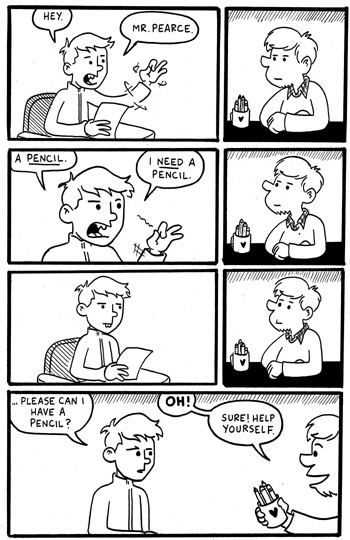 Teacher Comics: A good plan? My going out of my way to NOT wish kids a “Happy Birthday” has become something of a running joke to many of my students. You are currently browsing the archives for the 2012-2013 school year category.